Report by Rev. 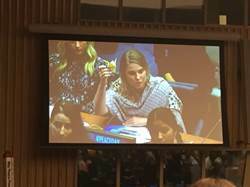 Deborah Moldow, Representative to the U.N. 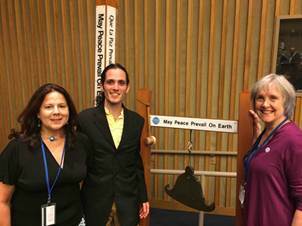 The World Peace Prayer Society celebrated its 20th anniversary of assisting the United Nations Department of Public Information in planning and implementing the U.N. observances of the International Day of Peace. 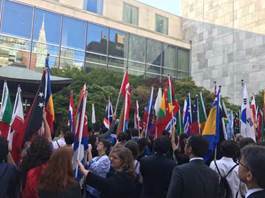 The annual student observance of the International Day of Peace, with the theme of “TOGETHER FOR PEACE: Respect, Safety and Dignity for All,” was opened by Ms. Alison Smale, the newly-appointed Under-Secretary-General for Global Communications, United Nations Department of Public Information, who greeted the 700 high school and college students gathered in Conference Room 4, along with those watching live at the U.N., at the Peacekeeping Mission in Bogota, Colombia and those watching the U.N. webcast around the world. She introduced Secretary-General Guterres, who delivered a warm greeting to the students. 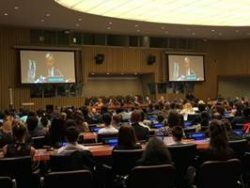 He said, “One thing is clear: the International Day of Peace is of special significance.” He called on the young people to do a better job with peace than his generation and spoke about his ten years serving as U.N. High Commissioner for Refugees. Mr. Guterres enjoyed a lively round of Q&A with the students, asking for their comments and suggestions as well as their questions and replying to them as adults. Ms. Smale then gave the floor Mr. Maher Nasser, who mentioned that the theme was close to his heart since he was a child of refugees whose parents were forced to flee their homes in 1948. 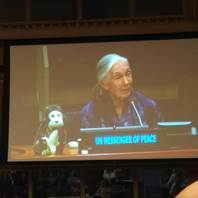 He introduced Peace Messenger Dr. Jane Goodall, who spoke movingly to the students about how everyone can create peace in their lives. She told about refugees in the African countries where the young people were involved in her Roots and Shoots program and how every religion respects the Golden Rule. She said we need to stop the war we are waging on the natural world. 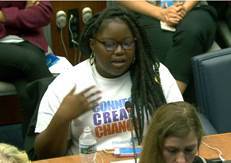 She ended on a note of hope in the young people, especially when they are empowered to take action. 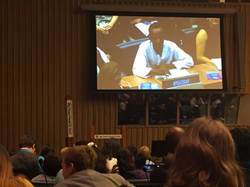 Next to speak was Ms. Jayathma Wickramanayake of Sri Lanka, the Secretary-General’s Envoy on Youth. She and Dr. Goodall also engaged with the students. Two animated films about refugees were shown. Youth Moderator Ms. Malala Waseme introduced the remainder of the program, including the peace projects presented by the young people via satellite at the Peacekeeping Mission in Bogota, followed by music provided by the talented sisters Omnia and Leila Hegazy, to the appreciation of the crowd. Then the students in the conference room whose projects had been selected for presentation. 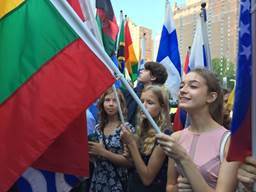 A wide range of inspiring projects were presented from the Mater Dei Prep emerging global leaders program’s Global Education Tool Kit to Breaking Walls arts for peace to the making and sharing Peace Cranes. 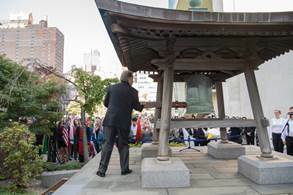 At the side of the dais, just beneath one of two giant screens, sat a six-sided Peace Pole and the WPPS peace bell. Just before 12 noon, two young refugee students now living in Vermont came to the front of the room to announce the Minute of Silence and the ringing of the peace bell. 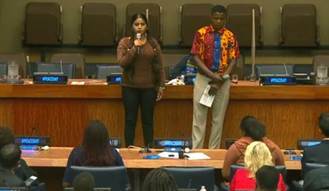 Malala Waseme explained that the Minute of Silence on the International Day of Peace would offer the opportunity of a 24-hour peace wave as a shared and practical act of peacebuilding (at 2:17:25 on the video). 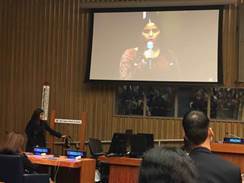 A young refugee girl from Iraq, Ms. Saja Amongali spoke about the WPPS peace bell being made from recycled weapons of war to introduce the Minute of Silence. The gong was sounded and everyone rose in silence. The message inscribed on the peace bell flashed on the double screens for all to see (at 2:17:12): May Peace Prevail on Earth! 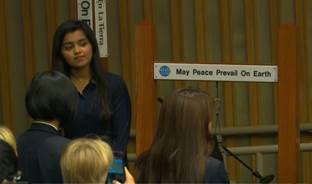 At the close of the conference (2:24:28), Malala thanked the guest speakers, the Department of Public Information, the World Peace Prayer Society, United Religions Initiative, Pathways To Peace, Peace Day Philly, Roots and Shoots, and others. We are grateful for this long-standing partnership in mutual respect and cooperation.